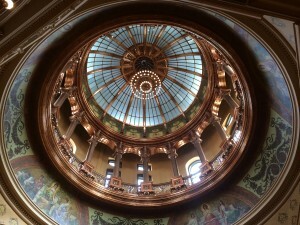 Suggestions for legislation to support open government and press freedom in Kansas | Kautsch Law, L.L.C. Over the past few months, Fresh Takes has documented the need to amend certain Kansas laws that govern public access to government information and that relate to press freedom. The following are summaries of possible statutory improvements that ideally would be a top priority in the 2016 Kansas legislative session. Revise the Kansas Open Records Act (KORA) so the definition of “public records” would include emails sent to and from non-government accounts that relate to public business. In the wake of revelations that state budget discussions conducted by private email are not open records subject to KORA, the legislature has tasked the Judicial Council Open Records Advisory Committee to recommend whether or how such communications should be subject to disclosure as open records. Such amendments may take an approach like that of many states, including Texas and Oklahoma, by revising the definition of “public record” to include communications created by state officers and employees that are “in connection with the transaction of official business.” More detailed comments on this issue are here. Revise KORA to provide for access to police body cam footage under KORA. The Judicial Council Criminal Justice Advisory Committee recommended enactment of a statute allowing subjects of police body camera footage express access to the footage, along with an amendment to KORA to incorporate such footage into the definition of “criminal investigation records.” Under this approach, body cam footage would be accessible within the existing framework of KORA the same as any other public record in Kansas. Revise KORA to limit the scope of the “criminal investigative records” exemption. Currently, there is no limit on when or how a law enforcement agency can refuse to disclose record that would not otherwise be exempt, leading to more than one dubious result. For example, a particularly questionable application of the exemption as currently worded is in the investigation involving the disappearance of Randy Leach, who has been missing since 1988. “The KBI and Leavenworth County sheriff’s deputies say they are still investigating the case and have refused requests from the parents and the Lawrence Journal-World to release them” more than 27 years later. The legislature should adopt language such as in Florida that defines when an investigation is no longer active, thus removing the criminal records exemption as a basis for non-disclosure after a reasonable period of time. Revise KORA to strengthen the requirement that public agencies respond to records requests by the “third business day” under K.S.A. 45-218(d). As set forth in K.S.A. 45-218(d), public agencies are required to respond to open records requests by the end of the “third business day” after the request is received. For various reasons, the provision has not been interpreted consistently since its inception in 1984 and has never been revised. If efforts to enforce the existing language fail, the Legislature might look to the Texas Public Information Act for guidance in strengthening K.S.A. 45-218(d). There, if the records cannot be produced at the time requested, the custodian sends to the requester a letter stating why they cannot be produced, and sets forth “a date and hour within a reasonable time when the information will be available for inspection or duplication,” and if the information is not produced within 10 days, the custodian writes another letter again setting “a date and hour within a reasonable time when the information will be available for inspection or duplication.” Texas Public Information Act, Secs. 552.221(c) and (d). Revise KORA to contain costs of “staff time” that public agencies spend searching for requested records under K.S.A. 45-219(c). A bill related to this issue, SB 98, has been referred to the Senate Judiciary Committee. However, credible opposition from local government agencies and advocates has emerged, arguing that the inability to charge for “staff time” would result in commercial and abusive requesters taking advantage of county government. Fortunately, Oklahoma’s open records laws addresses these same concerns as set forth in 51 O.S. 24A.5(3). As such, SB 98 should be further revised to model the Oklahoma provision and allow agencies to charge reasonable fees for staff time related to finding and producing records, but only for commercial requests and those that clearly “cause excessive disruption of the essential functions” of the agencies. Amend K.S.A. 22-2302 and K.S.A. 22-2502 to clarify that disclosure of a probable cause affidavit under either of those statutes makes it an open court record. Conflicting interpretations of the 2014 amendments to K.S.A. 22-2302 and K.S.A. 22-2502 have, in some instances, prevented court clerks from treating an affidavit as a public record after they disclose it to a requester. As a result, even though the affidavit already has been disclosed to the first requester, no subsequent requester can gain access to the affidavit without going through a process that includes a 10-day wait period. Although the Legislature plainly intended that an affidavit become an open record after being disclosed to a requester, the statutes should be amended to expressly state that affidavits disclosed to any requester are subsequently open public records, and become part of the court file just like any other filing, accessible under KORA. Amend voting law to allow for meaningful audits of election results. Currently, unless an election contest is initiated within 5 days, there is no mechanism to compare the results generated by controversial touchscreen voting machines with a paper record of votes. Fortunately, Secretary of State Kobach has recognized the need to increase transparency and accountability of elected officials, and has called for a “paper trail in every county.” The legislature should heed the call and incorporate aspects of laws from states such as Texas so that in any election where votes are tabulated electronically the results should be available for mandatory audit, either randomly or under certain circumstances, such as in an election where the vote is extremely close. Pass the anti-SLAPP bill introduced last year. The Public Speech Protection Act would strengthen Kansans’ right to freedom of expression while simultaneously protecting them against the threat of costly, groundless litigation. The Act would benefit defendants in cases that are considered to be Strategic Lawsuits Against Public Participation cases, or SLAPP, where defendants are sued, not because they have acted contrary to law, but rather just because they have said or published something that someone doesn’t like.